While doing a little shopping last weekend, I found a scent I'm head over heels for. 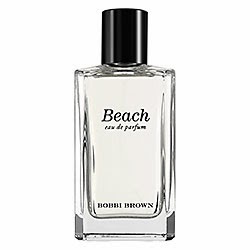 Have you smelled Beach by Bobbi Brown? It's absolutely delightful and a must have for summer. It conjures up all those lovely memories of surf, sand, salt air, beach waves in your hair and laid back style. Weighing in at $70 a bottle, it is a little more than what I typically spend on a seasonal scent. However, if you've ever dreamed of bottling up all those wonderful beach scents, this one is for you. Bobbi nailed it. This fragrance will not disappoint! Have you smelled this fragrance? Are you in love with it? I can't wait to secure a bottle very soon. Happy Friday Eve, dolls! I hope it's a great one! Oh my goodness, this brings back funny and sweet memories! When I was in highschool I babysat for a super sweet and cool woman and this is the scent she wore. Every time I would babysit, I would have to spray some on myself before I left. I finally bought my own bottle! I may just have to go and buy a new bottle! I've heard GREAT things about this scent; hearing it again from you only confirms that it's a necessity!